a benign pigmented melanocytic proliferation; raised or level with the skin, present at birth or arising early in life. Synonym(s): mole (2) , naevus pigmentosus. A patch of pale skin in which blood vessels are narrowed or contracted and blood flow is locally limited. A dark blue nevus covered by smooth skin. It is composed of melanin-pigmented spindle cells in the mid-dermis. An erectile, easily compressible, bluish, cavernous hemangioma present in the skin and gastrointestinal tract. 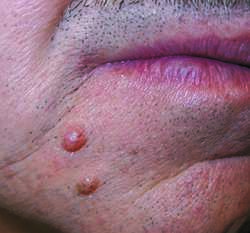 A nevus of dilated capillary vessels elevated above the skin. It is usually treated by ligature and excision. A horny nevus that contains a hard plug of keratin. It is caused by failure of the pilosebaceous follicles to develop normally. A nevus composed of collagenous tissue. A nevus composed of cells having some malignant characteristics. A benign nevus often found on the scalp, having a pale or tan center enclosed within a darker encircling rim. Raised nevi present at birth. They may be hyperkeratotic and widely distributed. In newborns, a tuft of hair over the lower spinal column. It may be associated with spina bifida occulta. A large reddish-purple nevus of the face or neck, usually not elevated above the skin. It is considered a serious deformity due to its large size and color. In children, these have been treated with the flashlamp-pulsed tunable dye laser. A papular brown nevus with an oval halo occurring in the first three decades of life. This type of nevus is usually benign but should be evaluated for malignancy. A nevus in which the melanocytes are found in nests in the dermis and have no connection with the deeper layers from which they were formed. A tumor composed of fatty connective tissue. It is probably a degenerated nevus containing numerous blood vessels. Any nevus that contains melanocytes. Malignant or suspicious lesions should be treated by wide surgical excision. Benign lesions do not require treatment except when located at sites of friction causing bleeding or ulceration. Some nevi are removed for cosmetic reasons. A congenital nevus that occurs in streaks or linear bands on one side of the body. It usually occurs between the neurotomes of the lumbar or sacral area. A nevus in which superficial blood vessels are enlarged. Nevi of this type are usually congenital. They are of variable size and shape, slightly elevated, and red or purple in color. They generally appear on the face, head, neck, and arms, though no region is exempt. The nevi usually disappear spontaneously, but wrinkling, pigmentation, and scarring are sometimes seen. A nevus formed of dilated venules. A nevus with a raised, wartlike surface.